First and foremost we want to wish Katy Perry congratulations on her engagement. 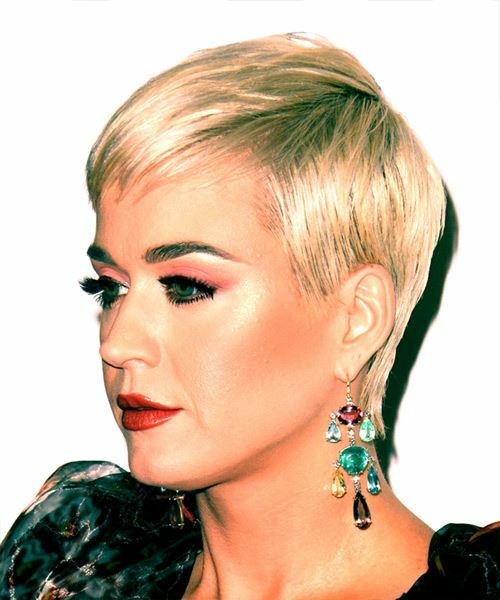 Katy Perry is nailing this pixie cut! The side swept short bangs help shape her forehead. This is a very clean, straight hairstyle that will not take long to get ready in the morning, however, you are going to need to use products to keep all the pieces in place and to make sure you do not have a few strands trying to run away. Due to the openness of this hairstyle, glasses will suit this hairstyle nicely. You are going to need to get your hair trimmed every 4-6 weeks to keep this style in shape as well as to ensure that you do not lose the asymmetrical factor of this hairstyle. Makeup-wise, you can apply as much or as little as you want. Do not forget to blend your base in properly as the shorter hair means that you can see the edges of your skin. You do not want to have gorgeous hair and a base mask to ruin the overall look.